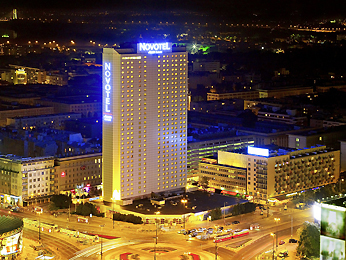 Book a room at the 4-star Novotel Warszawa Centrum with stunning views of the vibrant city of Warsaw. The hotel is located 5 minutes’ walk from the Central Train Station, with historic sites, monuments, shops and cultural institutions close by for great sightseeing. Find relaxation away from the hustle and bustle of the city as well as exquisite cuisine in the hotel’s modern bar and restaurant. At Novotel, we offer a fully equipped conference center and make sure every business meeting is a success.